Dwyer Instruments, Inc. was recognized for excellence in product design in the 14th annual Dealer Design Awards Program sponsored by The Air Conditioning Heating & Refrigeration News magazine (The ACHR News). An independent panel of contractors acted as judges in the contest that had 81 entries. 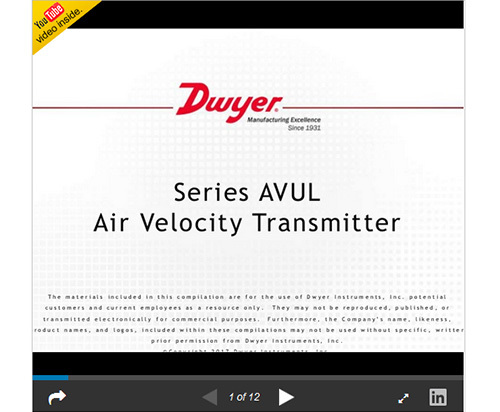 The company’s Series AVUL Air Velocity Transmitter was the Gold Award Winner in the Testing and Monitoring product category. The ACHR News is the leading trade magazine in the heating, ventilating, air conditioning, and refrigeration industries. To read the full announcement please visit http://www.dwyer-inst.com/2017DDAGoldWinner. Clean air and non-combustible, compatible gases. 1000, 2000, 3000, 4000 FPM (5, 10, 15, 20 m/s); field selectable. ±(5% of reading + 0.2 m/s) or ±(3% of reading + 0.2 m/s) @ standard conditions, depending on model. 24 VDC ±20% or 24 VAC ±20%. 5 to 95% RH, non-condensing. 4 to 20 mA, 0 to 5 VDC, 0 to 10 VDC. Current output: 0 to 1100 Ω max. ; Voltage output: Minimum load resistance 1 kΩ. Analog; power and output: four wire removable European style terminal block for 16 to 26 AWG. 1/2" NPS thread. Accessory: Cable gland for 5 to 10 mm diameter cable, A-151. Flow direction must be parallel to the sensor tip.